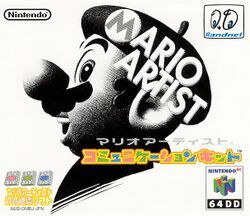 Mario Artist: Communication Kit is a game which served as an accessory in the Mario Artist series for the ill-fated Nintendo 64DD. As with the other games, it was only released in Japan, on June 29, 2000. It allowed players to connect to a RandNetDD internet service and upload their creations in the games to the internet. It also allowed them to swap creations through the games. They could even ask Nintendo for a print out of them. The player can find pre-made content that they can download to the other three games via a secret option in the menu. This page was last edited on June 27, 2018, at 22:24.